Yup. We strait up moved. If you haven’t heard the story yet, you can read all about our downsize and why we chose to move into a smaller home. Doing this was our first big step to creating a solid budget, building a debt payoff game plan and getting money back on our side. I’m not saying this is a step that everyone needs to take, but it’s definitely a step that too many people don’t take when they should. You should be spending roughly 30% or less of your income on your housing expenses. If you are paying more than this, it might be a good time to reevaluate your living situation especially if you are struggling to get out of debt. For years we heard about Dave Ramsey’s Financial Peace University that helps dig people out of debt. I should say, it gives people the tools and training to dig themselves out of debt. When we heard that it cost money to take the course we thought that was absolutely insane. We were struggling with money, how were we supposed to pay to get help? We had a scarcity mindset and were obviously not putting our money in the right places or we wouldn’t have been in debt in the first place. As soon as we got intentional with our finances, investing in Financial Peace University just made sense. We wanted out of debt and we needed help to get there. So we paid for it and it was worth every penny and has wound up saving us thousands of dollars. One of my recent posts dove deep into a big debt payoff confession: we started tithing while paying off debt. Tithing can be a word that turns people off when they hear it and I get it. For us, giving money away was more about letting go of the hold money had had on us for far too long. The crazy thing is, when you’re giving with a happy heart, more money seems to find you. Good fortune seems to be on your side. In order to change your finances, I strongly believe you have to change your heart. You have got to be willing to give freely. It’s like water: the tighter you try to hold onto it, the less of it you’ll have. Yup. We still don’t have a kitchen table. When I got into crazy debt payoff mode this summer we were able to pay off over $1,200 of debt in one week! We sold unused furniture, books, toys…a ton of stuff that was going unused. To be honest, I can’t even remember what we sold which just goes to show that we didn’t really need any of it. Most of the stuff we sold we had been hanging onto for years even though it was just collecting dust. We promised ourselves that once we were done paying off the debt we would get ourselves a new table. Our old one didn’t have enough seating anyway. When we started intentionally paying off debt we actually started paying attention to the huge interest rate on our credit card. Before we just happily made payments without a second thought. Now that I was budgeting and making payments, I felt like our total due never seemed to go down. With a 25% interest rate, I’m not surprised we never seemed to make progress. We had to do something about this never-ending debt so we decided to take out a loan with a lower interest rate. See if you qualify. Getting a lower interest rate we were able to keep our payments the same but we actually saw our total go down with each payment! Now, this wasn’t something we did to help ourselves get out of debt by any means. Homeschooling our kids was a decision we made and stuck to despite the fact that it might be seen as a setback. If our kids were in school it might have opened up opportunities to work more and put more money toward our debt payoff. Thankfully we found a homeschool program that helps lighten the financial costs of homeschooling, so we haven’t had to put much money into curriculum or supplies. If you are a homeschool family or have always wanted to be, I highly recommend checking out Harmony Education to help fund your homeschool journey. While I was homeschooling my kids, I was also working a part-time job while my husband worked his full-time job. When his hours changed, I found a different part-time job that worked around his new schedule. Then, as fate would have it, his hours switched again and I needed to quit my new part-time job after only a few months. Instead of letting it get me down, I decided to put my full efforts into running my blog and within a few months, I was making twice the amount of money I was making at my previous part-time jobs. Running a blog is by no means easy money, but it has definitely been worth it. Having this blog has helped me stay home, set my own schedule, and pay off thousands of dollars of debt. I believe in it so much that I created a course for aspiring bloggers to get a deeper look at exactly how to run a successful blog. Check out The Fun Sized Blogging Basics and take full advantage of 5 totally free lectures! While there was a lot of talk about quitting our gym, we didn’t actually take the leap until recently. The truth is, I need to stay physically active for my sanity. I homeschool. Our previous gym we had been at for almost 10 years, and it provided great childcare, a pool, and a great environment. It didn’t however, provide any discount with our insurance and it was over 20 minutes away from our new home! Although it meant giving up some of the perks, switching our gym saved us $75 per month on membership fees and even more on gas. If you love the idea of saving big time while still getting training, check out the Aaptiv app. I had the chance to try out the app this summer and absolutely loved it. See my full review. As I said, our schedule kept flip-flopping on us, but we kept trucking on. Even running the blog, I have to make time whenever I can throughout the day to get work done. Sometimes that means early mornings, sometimes late at night. The thing is, when it comes to hustling to pay off debt, you have got to be willing to do whatever it takes. Just like we purchased Financial Peace University to help us improve our finances, I have invested in blogging courses to help improve my blog. This money could have gone toward debt, yes, but the truth is I have got to invest in myself as well as the blog. If I want the blog to continue to bring in money, then that requires me investing back into it. Purchasing helpful blogging courses has helped me increase my sales, boost my following, and has taught me the importance of course creation. Can You Really Make Millions with Affiliate Marketing? Now this one I think would just be crazy not to do. We are an all-around dog loving family so when I heard about dog sitting through Rover I couldn’t wait to sign up. Rover is a site that allows people to find dog walkers and sitters in their area. To get started, I signed up as a dog sitter since I am home all day anyway. Within 20 minutes I booked my first dog sitting gig with an adorable Boston Terrier. I love Rover so much as a second income source that I wrote a post all about it or you can get signed up here. If you have a pup at home you could use some help with, make sure you check out Rover. Here’s a free $20 voucher! When our 10 year anniversary came up in June, we were smack-dab in the middle of hard-core debt payoff mode. It was super crucial to us to continue paying off our debt, but if life has taught me anything it’s that people and relationships are worth investing in. My father had passed away when I was 19. His ashes were scattered up north in Lake Superior and as much as I tried, I couldn’t ever really get over the fact that he didn’t make it to my wedding. So, we decided to renew our vows right where his ashes were scattered. We did everything we possibly could to make this vow renewal affordable but wonderful. Even when it came to taking our 4 kids and a boyfriend out to dinner, getting an Airbnb, and staying in a hotel, we were able to keep our total costs under $1,000! Get a $40 Airbnb credit here! How did we make hotel and Airbnb stays so affordable? We didn’t go out to eat much. When we were staying in our Airbnb, we made our own breakfasts and dinners as most people do. Then when we arrived at our hotel, we brought along a cooler full of food. Maybe eating salad out of an ice bucket doesn’t sound romantic to you, but it was a compromise we were willing to make if it meant spending a few days in a hotel together celebrating our marriage while saving money for debt payoff. People talk a lot about survey sites and I loved the idea of making some extra cash just by hanging out on the couch and answering a few questions. iSay – iSay is a survey company that gives you rewards just for voicing your opinion! Collect points and redeem for gift cards or shop at the iSay market. You can even create your own polls! Springboard America – Springboard America is a survey company that is interested in learning more about the values, attitudes, and taste of Americans. Angus Reid (Canada) – Get paid for your opinions! iSay (Canada) – Share your opinion and earn rewards! Maru Voice (Canada) – For those Canadians hoping to make some extra cash by voicing their opinions, Maru Voice is a great outlet. Yes, we stopped going out to pay off debt. Probably not too exciting of an announcement but it was huge for us. We had always been so quick in the past to go out whenever we wanted to. Being a stay at home mom, I have always made an effort to get out and have fun and for months and months and months I didn’t. I am so thankful to have a close group of friends that are still a huge part of my life. 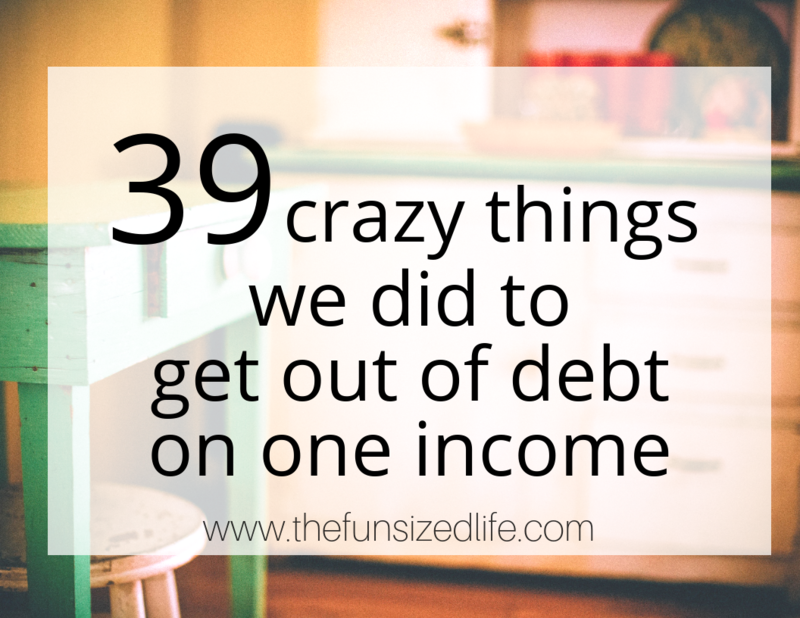 When it came to debt payoff, I had to start saying no to them. Not only is it hard for me to say “no” to pretty much anyone, but it was even harder saying it to friends. When they wanted to go to amazing plays (that I love) I had to say no because my money had plans that didn’t include a night out. Remember whenever you say “no” to something you are really saying “yes” to something else. This is a big debate for a lot of people who are trying to save money. Some say not to buy in bulk because you end up spending more. For our family, I noticed when we bought in bulk I was able to spend less, eat healtly and make our food last longer. For example, a Costco sized bag of oats plus 6 containers of almond milk provided us with oatmeal for at least two weeks. Throw in bananas and you’ve got my three ingredient waffles. Top these off with some heated up frozen berries and both options are perfect for breakfasts. For lunches, we’ll buy lettuce and greens for salads. Dinners are meats and frozen veggies. Switch up the seasoning and you have dinner 7 different ways no problem. If meal planning is not something you are very good at, check out the $5 Meal Plan for easy and affordable meal ideas! Another great option is purchasing groceries and other products through Brandless.com. Everything on the site is only $3 and you get free shipping when you spend $39. Click here to get a $6 credit toward your first purchase! Yes, that’s right, we put our youngest kids (7 and 8) to work. NO, we didn’t make them pay off our debt. We wanted to instill a good work ethic and money practices in them at a young age so we got them started with their first job. They pick up dog poop for a family down the road. Glamorous, right? They made their own flyers and handed them out door to door and even though only one family got back to us they have never complained. Using the Dave Ramsey Financial Peace Junior kits we have taught them how to save, give and spend money wisely. More than anything we don’t want our kids falling into the same mistakes we made which is why we have put such an effort into getting them started with money at a young age. Years ago, when I was digging myself deep into debt, I was a huge clearance shopper. I had convinced myself that if there was a sale, I was getting a bargain..even if I didn’t originally intend on spending anything. –Funny how that works. Now when I shop, I shop for quality items that I know will last me a long time. Instead of spending $50 on 5 items I would much rather purchase one quality item that I really get use out of for $50. Plus, I have gotten even more intentional with my wardrobe, which has made me far pickier about the clothes I wear. Don’t get me wrong, I still love saving money! If I can shop for discounts and sales using coupons while still buying the things I want then I absolutely will! There are a few top ways I choose to save every time I shop. Check out these amazing money savers that not many people know about. Ebates an Ibotta – Both Ebates and Ibotta are great rebate apps. You choose where you want to shop from their list of vendors and then they will give you some of your money back! Honey – Honey is a great app for shopping online because it will tell you any coupons you might be able to take advantage of! Join Honey. Do$h – Do$h is a rebate app a little different from the rest. It will link up to your credit cards and automatically give you money back on any qualifying purchase! Click here to get $5 for Do$h! Drop – Drop is similar to Do$h except you get to the pick the places you save and you can sign up for different promos Drop offers throughout the month! Try Drop. No surprise here. When it came time to getting serious about paying off debt, we stopped buying stuff altogether. Every single purchase we made we would plan for in advance. It wasn’t an absolute necessity, we didn’t buy it. Right now I am sitting on a bed with a hole-filled comforter and 2 missing pillow shams. Why? because we don’t really need new ones right now. We’ve learned to be content and thankful for what we have and make sure our money goes to the most important places first. When we first downsized and moved into our smaller house, I wanted to get a beautiful garden started too. In our previous house I had failed twice at gardening and unfortunately, this time was no different. We had heard great things about how having your own garden can save you a ton of money especially when you eat as many fruits and veggies as our family does. Unfortunately, we wound up spending a ton of money on gardening soil, equipment, and seeds and got very few plants out of the deal. Eventually, we called it quits on gardening and decided to just purchase from the local farmer’s market whenever possible. Never have we been one of those families who needs to keep up with the latest phone trends. Instead, we use ours until they are completely unusable. We have hung onto cracked screens and broken buttons longer than most people would. Now, wouldn’t you know it, just like I no longer shop clearance, I no longer shop cute phone covers. When I purchased my latest phone I also made sure to get a thick, sturdy, high-quality Otter box to prevent any breaks or scratches. It’s not cute, but it will ensure my phone purchase lasts longer. Because we stopped buying stuff, we happily began accepting anything that was offered for free. For years I was living in hand-me-downs from friends and my 23-year-old stepdaughter. When our son needed a dresser, I scooped one up on the side of the road for free. A few coats of paint and before you know it I had people asking me where I got such a cute dresser from. Why, oh why would I throw away coupons when I was trying to get out of debt? Well, I would keep the ones I needed, but any “tempting” coupons went straight into the recycling. Fabric and craft store coupons, clothing stores, travel discounts…anything that might tempt me into spending money I didn’t have were immediately discarded. As someone with a serious shopping addiction, this was a totally necessary step. If you don’t want to give back into temptation then you have to get rid of that temptation altogether. During debt payoff, we closed down and cut up credit cards left and right and then…we opened a few up. We did this only when we were making a purchase that we already had the cash to pay for. Often times when you open a new credit card you can get a 10% (or so) savings on your purchase. When you are making a rather expensive purchase, this discount can be incredibly helpful. To avoid going further into debt, make sure you have enough money to cover your purchase and then pay the credit card off as soon as you get the bill…or sooner! I choose to go into my online banking and instantly make the exact payment amount toward credit cards so I don’t forget about them when the bill comes. Want to know your credit score? Check your FICO score here. During our debt payoff my husband continued working full time, I worked a few part-time jobs and started a blog. When we really got into crunch time, I decided to go back to work doing photography again. I reached out to family and friends on Facebook to let them know I would be doing photos at a discounted price and that if anyone needed wedding photography I was willing to do that too. While homeschooling, running a blog and taking and editing photos doesn’t make for a lot of free time, it sure made a difference when it came to paying off our debts as fast as possible. Investing during debt payoff goes completely against the Dave Ramsey Baby Steps that I know and love, however, some opportunities are just too good to pass up. When I heard about the Acorns investing app, I did months and months of research and deliberating before I finally made the leap. See my story here. Even though we were still putting as much of our earnings toward debt payoff, Acorns was investing literally our loose change. Just like our grandparents taught us to put all our change in a loose change jar for a rainy day, Acorns is doing this for people but actually allowing them to gain interest! With Acorns, when you make a purchase, say a cup of coffee for $3.75, Acorns will round up your total to $4 and invest the .25 cents for you. It’s a great way to start investing for those who aren’t quite sure how to start. On top of that, you barely even notice that the money is gone and it might actually make balancing your account even easier because you’ll be able to round up all your purchase totals! Give Acorns a try! Instead of always trying to go out to eat, get drinks, or go to the movies we decided to get creative with how we spent our date nights. The best part about finding free date nights is that you actually wind up spending more time together! We have hiked waterfalls, rollerbladed around park trails, and even spent quiet nights in with wine and Scrabble. There really is no shortage of totally free date night ideas. In years past when an emergency came up like a flat tire or a sick pet, we usually had to turn to our credit cards to pay the bill. Now we have a set $1,000 savings that we use when emergencies arise. See how to build yours quickly. I can’t believe we did this so wrong for so long. It feels awesome to be able to pay a bill and then walk away knowing that we won’t be gaining interest on any charges. Another big step we took during debt payoff was to only pay for things with cash! This was a scary step for me because cash and I did not have a good history. It seemed like whenever I had cash, I lost cash. Literally. It would blow away in the wind and never be heard from again. Now the only money we leave in our account is gas money. All of our groceries, fun money, and sinking funds are taken out in cash. Doing this has helped us keep better track of our spending because we can physically see how much money we have left. I had never been a big coffee drinker, but when I was working part-time as a preschool teacher, suddenly I seemed to need an energy boost in the morning (what do ya know.) Although I only worked twice a week, I found myself stopping by the gas station to get a $1.25 coffee to start my day. Eventually, I caught on to how big of a money waste this was and decided to bite the bullet and buy a tiny $15 coffee maker. Of course, I know it’s still nice to treat yourself to a cup of coffee once and a while. That’s why I love the iSay survey site so much. You can earn gift cards to places like Starbucks. Hey, if we’re going to get furniture off the side of the road for free, we may as well take advantage of some of the great Goodwill deals too! When our daughter needed a dresser I was thrilled to find one for super cheap at our local Goodwill. Just like the free one, I was able to completely repurpose it to be the exact style we wanted for her bedroom. See the full tutorial. This is partially debt payoff, partially choice. When we moved into our smaller house, I really wanted to be intentional with how I decorated. I didn’t want to walk around my home and look like it fell right out of a catalog. More than anything I wanted my home to have character and meaning. In our decoration, I have so many family heirlooms like vintage cameras, vases, paintings, pillows and more. So many things trace back to my childhood and hold a special place in my heart. Plus, they didn’t cost me anything! We had already started sitting through Rover and I decided maybe I should branch out a little to find more ways to make additional income. So I changed my Rover settings to include dog walking. Again, rather quickly I met a family who needed a few walks for their dogs while they were out of town which quickly turned into sitting them overnight for a week! Yes, we went through the process of filing our taxes! What we didn’t do was spend the money foolishly like we once used to. Instead, we put the majority of the money we got back right toward paying off our final debt! Chances are you are already doing this anyway. Hopefully only via social media! What I mean by stalking is that there is a great #debtpayoffcommunity on Instagram. Taking the time to follow people and their debt payoff journey is really inspiring and motivating especially when debt payoff gets really hard. Not only can you get motivation but you can also gain a ton of ideas by following along with other people who are taking the same journey as you. We are big movie fans. Always have been. In fact, I knew I was in love with my husband the day that he quoted Dumb and Dumber. I swear you could hear violins play. Even though we have a soft spot in our hearts for cheesy comedies and sci-fi thrillers we still went through and got rid of the majority of our movie collection. There are places like Decluttr that will give you an exact price of how much you can get paid for your old electronics and DVDs. Once you have your price estimate, you ship everything to them, free of charge, and then wait for your check in the mail! It is crazy easy. Check out my post on how it all works. Our family has always loved travel and when we moved into a smaller house and started paying off debt, we did it with travel in mind. Minimalism can actually be really helpful when it comes to saving for travel. Over the last few years instead of flying to see family or driving across the country, we have taken smaller, less expensive road trips. It has been really great to learn more about our great state of Minnesota and take in all of the attractions that are right in our backyard instead of spending thousands of dollars to see someone else’s. I thought I might end this post on a more humorous note. The last few years have been full of a lot of scrimping, saving and budgeting and somehow we have managed to keep it all together. Having only one steady stream of income can be a great stress for people when it comes to paying off debt. Instead, we’ve looked at it as an opportunity to get creative! Hope I have inspired you to do the same. This is an INSANELY good write up on debt-payoff strategies! I am amazing at your level of commitment, not only to paying off your debt, but also inspiring others to do so as well. I am pinning this to read again, it’s that good. Thanks! That’s impressive! You clearly are helping others with the amount of quality information provided in your post. It made me think of creative ways to save more money. Also, we recently signed up for Rover (we needed a sitter) and the first thing I thought of while scanning the site for the first time was, we should do that too. We already watch our friend’s dogs and our dogs love the company; super friendly labs. I thought it was great that so many people were willing to take care of other peoples pets. I’ll pin your post so others can enjoy it as well – great job! Thanks so much! I’m glad this was all helpful to you! Rover has been an awesome extra income! I was worried after summer ended that I would be limited but I have made about $600 this month alone! Bravo Renee!!!!!!!! This post is filled with so many options, there are so many to choose from. If you sit back and think about it it’s true. Getting out of debt takes a lot and if it requires a lifestyle change…then so be it!!!!!!!!! LOL. This was a great read and I will definitely try out some of these strategies. It absolutely does!! We took a little break and are ow getting ready to go back into full swing! I loved your crazy things to save money. I’ve read a lot of blogs about the subject. Most of them are just redundant. Yours was full of good common sense ideas! I loved the fact you didn’t quit your gym & you were still concerned about healthy meals. Most of “minimalists” bloggers, talk about giving up cable, gym, & eat (sounds like) every cheap food available. Everyone needs to stay physically fit & healthy! Money means nothing if you aren’t healthy enough to enjoy it. Exactly. My health is a top priority for sure. May as well spend a little more to try and prevent doctor bills later on!